Steven W. Dulan and Arkadi Gerney take a look at gun laws and the tragedy in Orlando. On June 12, 2016, tragedy struck at Pulse, a popular nightclub within the LGBT community in Orlando, Florida, after a gunman, Omar Mateen fatally shot 49 people and injured 53. This tragedy is one of the deadliest mass shootings in the United States and the nation’s worst terror attack since 9/11. In a Father’s Day address, President Obama said gun violence was “preventable” and too common. “It’s unconscionable that we allow easy access to weapons of war in these places,” he said. And just yesterday, a divided Senate voted down 4 gun control measures. So what needs to change when it comes to gun laws, all while protecting the Second Amendment? And can bipartisan gun legislation curb gun violence and prevent future mass shootings? In this episode of Lawyer 2 Lawyer, hosts J. Craig Williams and Bob Ambrogi join attorney Steven W. Dulan, first vice chair of the Michigan Coalition of Responsible Gun Owners and Arkadi Gerney, senior fellow at the Center for American Progress, as they take a look at gun laws and the tragedy in Orlando. They will talk reaction, the gun control debate, the Second Amendment, Florida gun laws and potential legislation. Attorney Steven W. Dulan is first vice chair of the Michigan Coalition of Responsible Gun Owners. MCRGO is the largest state-based firearms advocacy organization in America and its mission is to promote safe use and ownership of firearms through education, litigation, and legislation. Steve has appeared on various media outlets to discuss gun ownership, including CNN (with Christiane Amanpour and Piers Morgan), FOX and Friends, NPR, and HuffPost Live. Attorney Arkadi Gerney is senior fellow at the Center for American Progress, where he focuses on crime and gun policy. Arkadi previously worked as special advisor and first deputy criminal justice coordinator to former New York City Mayor Michael R. Bloomberg, where he managed Mayors Against Illegal Guns, a national coalition that Mayor Bloomberg co-chairs. During four and a half years in the New York City mayor’s office, Gerney oversaw the coalition’s growth to more than 600 mayors, led successful campaigns to influence federal legislation, partnered with Walmart to develop a landmark gun seller code of conduct, and led New York City’s undercover investigation of out-of-state gun shows. Intro: It turns out an AR 15 is effective at what it does. A gun is a tool for punching holes in things at a distance. An AR 15 is not a bad choice, especially for females or smaller males because it’s got a low recoil. It’s got an intermediate power, round, it’s accurate, it’s effective. There are 6 million of them out there that didn’t hurt anybody today and maybe saved some lives. There are anecdotal cases of individuals being faced with attackers who needed that firepower. And whether you think it’s a good idea to personally own a gun or whether you think it’s a bad idea to personally own a gun, the vast majority of people including the vast majority of gun owners understand that there’s a bunch of things we could do to make it harder for certain kinds of people to own guns. J. Craig Williams: Hello and welcome to Lawyer 2 Lawyer on the Legal Talk Network. This is Craig Williams coming to you from sunny, blistering hot, Southern California. I write a blog called May it Please the Court. Bob Ambrogi: And this is Bob Ambrogi coming to from outside of Boston, Massachusetts where I write the blog Lawsites. 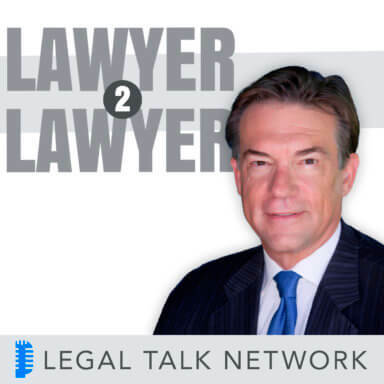 I also co host another show on Legal Talk Network, Law Technology Now with Monica By; give it a listen. Before we introduce today’s topic, I’d like to take a moment to thank our show sponsor, Clio. Clio is the world’s leading cloud-based legal practice management software. Thousands of lawyers and legal professionals trust Clio to help grow and simplify their practices. Learn more at www.Clio.com. J. Craig Williams: Bob, on June 12, 2016, earlier this month, tragedy struck at Pulse, a popular nightclub within the LGBT community in Orlando, Florida after a gunman, Omar Mateen, entered the club shooting and killing 49 people and injuring 53 others. This tragedy is considered among the deadliest, if not the deadliest, mass shooting in the United States and the nation’s worst terror attack since 9/11. In a Father’s Day address, President Obama said gun violence was preventable and far too common. It’s unconscionable that we allow easy access to weapons of war in these places, he said. And just yesterday, a divided senate voted down for gun control measures. Bob Ambrogi: So what if anything needs to change when it comes to gun laws? Can we get bipartisan gun legislation and if we can get it, curb violence and prevent future mass shootings? Today on Lawyer 2 Lawyer in the wake of the tragedy in Orlando, we’re going to take a look at gun laws, gun control and the second amendment. J. Craig Williams: Bob, we have two guests to help us do that today. Our first guest is attorney Steven W. Dulan. He is first vice chair of the Michigan Coalition of Responsible Gun Owners. MCRGO is the largest state-based firearms advocacy organization in America and its mission is to promote safe use and ownership of firearms through education, litigation, and legislation. Steve has appeared on various media outlets to discuss gun ownership, including CNN (with Christiane Amanpour and Piers Morgan), FOX and Friends, NPR, and HuffPost Live. Welcome to the show, Steve Dulan. Steven W. Dulan: Thanks for having me. Bob Ambrogi: Also joining us today is Arkadi Gerney. Arkadi is senior fellow at the Center for American Progress, where he focuses on crime and gun policy. He previously worked as special advisor and first deputy criminal justice coordinator to former New York City Mayor Michael R. Bloomberg, where he managed Mayors Against Illegal Guns, a national coalition that Mayor Bloomberg co-chairs. During four and a half years in the New York City mayor’s office, Gerney oversaw the coalition’s growth to more than 600 mayors, led successful campaigns to influence federal legislation, partnered with Walmart to develop a landmark gun seller code of conduct, and led New York City’s undercover investigation of out-of-state gun shows. Arkadi Gerney, thank you for being with us today. Arkadi Gerney: Thanks for having me on. Bob Ambrogi: As you both heard the news of this latest mass shooting, I’m sure you both had all sorts of thoughts. Steven Dulan, could we start with you as vice chair of the Michigan Coalition of Responsible Gun Owners? How do you react to something like this? I’m not asking about your reaction to the tragedy because of course we’re all pained by the tragedy. But in terms of legislation, does this make you think we need to change our nation’s gun laws? Steven W. Dulan: I do but probably not in the way that you’d think. The first reaction I had in terms of thinking about gun control and gun law is that this is completely predictable. I have been saying in the media for years that these places where people are not allowed to carry are mass murderer empowerment zones. And when you add the overlay of radical Islam Jihad to a gay nightclub, it’s even more predictable that that’s going to be a target. I teach a class at Cooley Law School called gun control seminar, and I tell my students the first day of class every term, I’m pretty sure there will be another multiple victim public killing this term that we could discuss in detail. And this is just the latest one. Bob Ambrogi: Isn’t it a recipe for disaster to be saying that everybody in the Pulse nightclub or people in the Pulse nightclub should have all been carrying weapons? Couldn’t that lead to its own? Steven W. Dulan: I would never say all, I’;m really not saying that. But what I am saying is could it have been any worse? J. Craig Williams: I guess the question is what, if anything, do we want to do about it? It almost sounds as if the predictability of it has made it so insensitive that it’s not worth doing anything about. Is that what I’m hearing or do you have a solution to offer for this? Steven W. Dulan: Oh sure, I’ve got a specific policy proposal which is eliminate so called gun free zones, because they’re not. They’re just magnets for psychopaths. That’s known since World War II only one multiple victim public killing has occurred in a place where guns weren’t prohibited and that was the Gabby Giffords shooting. Every single other one happened in a place that had essentially a big sign out front saying psychos come here and kill us. Bob Ambrogi: Arkadi Gerney, what’s your position of this? I’m certain it’s much different but given your work over the years, what do you think needs to be done at this point? Arkadi Gerney: I think in the Pulse nightclub there was an off duty police officer who was employed as a part time security guard who was armed in the nightclub. He tried to prevent the shooter from coming in and it didn’t prevent the shooting. I think when 9/11 happened, we thought about how to make planes safer. And one of the things that happened was we had more air marshals on planes. We also had a program with enormous background checks and training. Some pilots could carry guns if they wanted to do so and went through the program. So one response to risks could be to arm certain people, make sure they’re highly TRAINED> But it would’ve been crazy after 9/11 to have the air marshall program but to take away the TSA and the screening of other passengers as they’re coming onto the plane. Nobody would think it’s a good idea to say 9/11 happened, why don’t we have everybody on the planes carrying guns. No. You want some armed folks and having air marshals on planes is no doubt made them somewhat safer. But so has having much stronger and better detector systems as passengers are getting on the planes to make sure that the vast majority of the people getting on the planes are not armed. So we do have a background check system in this country. It’s designed to prevent dangerous people from accessing guns. But there are certain categories of dangerous people who are not covered by the background check system including people in the terror watchlist, which Mr. Mateen was in 2014. And there are certain transactions, gun sales and gun transfers that are not covered by background checks – at least under federal law such as so called private sales. This is when somebody is selling guns out of their house or at a gun show or online. They don’t sell a lot of guns, perhaps, so they’re not a licensed dealer, but they’re selling guns, making them available, advertising them for sale, and selling them no questions asked. So if there was an option to get on a plane without going through security, if you were a terrorist, that’s the option you would choose. So we need to have a system that might involve more security at certain places at certain times. But we should also make it more difficult for the bad guys to get guns. Bob Ambrogi: Are you talking about metal detectors in every public place or are you talking about stricter background checks on gun purchasing? Arkadi Gerney: I’m talking stricter background checks. I think another issue is firepower, which is that part of the reason that Mr. Mateen was able to kill as many people as he did was because he was using a semi automatic assault rifle. That is a derivative of a fully automatic assault rifle that is designed for combat. A question should be, does it make sense to have easy, basically unregulated civilian access to these kinds of guns. And what kind of a fight is it if you do have an armed, off duty police officer trying to protect people in the club who might be having a handgun? Are you creating a risk by making it extremely easy for terrorists, felons, and other dangerous people to access assault rifles? J. Craig Williams: Steve, are we looking at a police state? I travel internationally and I see an awful lot of places, especially beaches and popular tourist destinations that have a lot of gun=toting police officers. If your proposition is to arm everybody, are we essentially a society of 300 million people that have guns? Steven W. Dulan: I never said arm everybody; I really haven’t. But the truth is you’re surrounded by guns all the time, everywhere you go. There are guns in the hands of police, military, but they’re also in the hands of private citizens. They’re also in the hands of criminals. And the interesting thing about the whole idea of gun control is it’s really only effective against the people you don’t have to worry about. The truth is, prohibition doesn’t work; we know this by looking at the failed war on drugs. Everyone on this call knows somebody who knows somebody who could get us drugs tomorrow if we really wanted them. And the same goes with guns. They flow freely across borders, state and national borders. They exist, they’re easy to make; once you make one, they last several human lifetimes with minimal maintenance. So Pandora’s box has opened. Guns exist. Now the only question is are you going to put into place irrelevant, possibly harmful rules that actually make things more dangerous? I think one thing everybody agrees on is we want the world to be safer. I just don’t think you get there by disarming law abiding citizens. J. Craig Williams: Who do we arm? Bob Ambrogi: Steven, what about Arkadi’s point about the type of weapon used here? What’s the justification for allowing regular citizens to be buying essentially military grade weapons that can fire dozens of shots in a minute? Steven W. Dulan: This is really old technology, honestly. What we’re talking about is semi automatic technology. That goes back to the late 1800’s. Probably at this point, the majority of the over 300 million guns – we might be pushing 350 million now in the US – the majority of them are semi automatic. That’s kind of the normal firearm at this point, pistol or rifle. Even shotguns. There’s nothing unusual about that. And I know that the gun used in this particular instance was not an AR 15, technically. I’ll put the technicalities aside and say okay, let’s just say it was an AR 15 for a minute. We’ve got approximately 6 million of those in private hands right now. The vast majority of which don’t do any harm and some of which do some good. So put aside the fact that the second amendment is also a political right and we live in a country founded on armed revolution. So just put that aside for a moment. And I’m very familiar by the way. I don’t know if I mentioned it to you guys but I’m a former US army infantry sergeant. I was honor graduate of my armors school and I worked on the M 16 and I bought my first AR 15 back in the 1980’s. And they’ve been available for civilians since the 1960’s. So this is not anything new or surprising or revolutionary by any means. But it turns out an AR 15 is effective for what it does. A gun is a tool for punching holes in things at a distance. An AR 15 is not a bad choice, especially for females or smaller males because it’s got a low recoil. It’s got an intermediate power, round, it’s accurate, it’s effective. There are 6 million of them out there that didn’t hurt anybody today and maybe saved some lives. There are anecdotal cases of individuals being faced with attackers who needed that firepower. Arkadi Gerney: Reasonable minds might differ about whether guns like the one that was used in this attack, or the AR 15 derivatives that were used in the Sandy Hook shooting, the San Bernardino shooting, the Aurora shooting, whether those guns should be available for civilian purchase and ownership. For ten years, at least some of those kinds of guns were banned federally in many states, do ban the possession of those kinds of guns. And if you look at polling, seems like roughly 55 to 60% of Americans support an assault rifle ban. But even if you disagree on that question, the other question that almost everybody agrees with is that we should not make it easy for felons, domestic abusers and people on the terror watch list to buy guns no questions asked because they’re going to a gun show or private seller who’s selling a gun without background checks. Or they’re able to buy guns from a gun dealer because the FBI doesn’t have the power right now to block sales to people on the terror watch list as Mr. Mateen was. So I think if you look at the polling there, 80 to 90% of Americans think there should be a background check on every gun sale, not just the guns sold by gun dealers. And 80 to 90% of Americans think that FBI should have the power to block gun sales to people on the terror watch list. So even if we take the question on assault rifles and whether they should be legal at all, the thing that almost everybody seems to agree on is whether it’s an assault rifle, a shotgun or a revolver, that felons, domestic abusers and terrorists shouldn’t have easy access to them. J. Craig Williams: Arkadi, how do you – given the polling and putting that aside – how do you get around the second amendment with respect to those proposals with Heller in mind? Arkadi Gerney: You don’t have to get around the second amendment at all. In 2008, the Supreme Court had its landmark decision and the Heller case is very, very clear in that case. The majority opinion written by the late Justice Scalia that this constitutional right, like other rights, is subject to reasonable regulation. And there’s been hundreds of second amendment related challenges and lawsuits that have been brought since the Heller case, including the case challenging the Connecticut assault weapon ban which is one of the toughest assault weapon bans in the country. And two days ago, the Supreme Court declined to take that case, suggesting that they believe that the complete ban on assault weapons is consistent with the second amendment. And if there’s no question that things like banning felons from accessing guns or requiring background checks is consistent with the Supreme Court’s interpretation of the second amendment. So the question was do you want to pass a law to ban all guns? Under the Supreme Court’s Heller ruling, that’s not going to fly anymore. But if you want to ban certain types of guns that are deemed dangerous or unusual, or you want to ban certain types of people who present a heightened risk, there have been a lot of legal challenges since Heller about those and in almost every instance, those laws have been upheld. Bob Ambrogi: We need to take a short break before we move on to our next segment. We’re going to hear a word from our sponsor, stay with us. Bob Ambrogi: Clio is an invaluable software solution for law firms of all sizes, handling all the demands of your growing practice from a single Cloud-based platform. Clio enhances your firm with features such as matter and document management, time tracking and even billing. Clio is an effortless tool that helps lawyers focus on what they do best, practice law. Learn more at Clio.com. J. Craig Williams: Welcome back to Lawyer 2 Lawyer, this is J. Craig Williams and with us today is attorney Steven Dulan, first vice chair of the Michigan Coalition of Responsible Gun Owners and attorney Arkadi Gerney, senior fellow at the Center for American Progress. In our last segment we’ve been discussing the tragedy in Orlando and application of gun laws. Steve, what’s your position on the recent legislative gun amendments that have been rejected by the senate? Steven W. Dulan: The scariest one to me was the so called no fly no buy that really deeply offends my sense of justice in terms of due process. There is no due process for putting someone on that watch list. We’ve all probably seen the same stories on the internet of people who are mistakenly put on the watch list and still can’t get off, sometimes even years later. That’s my biggest issue is the complete lack of due process. The idea of putting an unelected bureaucrat, maybe a law enforcement agent, whoever, in charge of just putting names on this list, frankly, I find frightening. Arkadi Gerney: I think like every other constitutional right, we have to think about the balance between liberties and what we’re trying to do with a particular law or situation. There already is a no fly list and it prevents sometimes people from travelling. That is intention with parts of the constitution including the privileges and immunities clause and there is a process after you’ve been prevented from flying to get off that list and it’s certainly true, especially ten years ago, there were a fair number of misidentifications on the list but the last has gotten better over time. But what we’ve seen from the data is that over the last ten years there have been more than ten thousand instances where people who are on the terror watch list or were on the terror watch list have been able to buy guns from gun dealers. And some of the people who were on the terror watch list were Mateen who killed all these people in Orlando. The attack in 2015 on a military post in Tennessee was by someone who was on the terror watch list. Another attack in Arkansas in 2009, a fatal attack, was by someone who was on the terror watch list. So these risks are real and at one level, two thousand people over ten years sounds like a lot. But that’s about 200 people a year out of 14 million gun transactions. So the chances that a law abiding citizen who is not an actual terror threat is going to have their gun sale delayed is at highest, 200 out of 14 million. Very unlikely. Bob Ambrogi: I’m wondering what else you think might need to be done. As we all know too well, not every mass shooting is from somebody with terrorist sympathies. Not every mass shooting has been by somebody who has had criminal record or any other prior indication that they would go off and do something like this. So watch lists or background checks, in and of themselves, seems to me like they are not enough. What else should Congress be looking at doing here? Arkadi Gerney: I think that if you look at the level of gun violence and gun deaths in the United States, it is way, way out of line with highly industrialized countries. There is no explanation for it other than the level of guns we have here. But if you accept that there is a constitutional right, guns are going to be part of American culture in a way that they aren’t part of cultures of other peer nations. But we can still make a gun culture much safer. For example, we have a car culture in America; Americans love cars and we have hundreds of millions of them out there. But we’ve made in the last 50 years, cars five times safer. You’re five times less likely to die in a car for every mile travelled. And that wasn’t one intervention, it was a whole bunch of interventions from seatbelt laws to drunk driving laws to technology like anti lock brakes and air bags. All of these things, culture change, about drunk driving, all of these things made our car culture much safer. We can still have a lot of guns in America, hundreds of millions of guns. But if we have a whole bunch of interventions from stronger background checks to borrowing certain kinds of military style guns, there’s a lot of data to suggest – if you look at the experience of states who have stronger laws – that gun deaths would go down. We would still have above normal gun deaths, but if we can take 33 thousand gun deaths and cut it by 10%, we’re saving 3,300 people a year. If we can cut it in half, we’re saving 15,000. J. Craig Williams: Steve, if you assume the proposition that since assault rifles have been available for over 50 years as really more of a societal change than it is guns as the cause of this. What do responsible gun owners feel society needs to do to change in order to prevent these mass murders? Steven W. Dulan: Well, you can’t prevent them, let’s just start there. It’s literally impossible. In fact, I really want to challenge the statement I heard about comparing the US to other countries. When I looked at those numbers, there’s a cherry picking of other countries going on. Usually they leave out most of Eastern Europe, which is considered fairly well developed at this point, part of the EU, et cetera. But most of the countries in Eastern Europe actually have a much higher rate of firearms used in homicides than the US does, for example. So I reject the idea that we’re somehow an outlier. When you actually look at the numbers, violent crime is down, crimes involving guns are down, two thirds of the people who die using firearms every year in the US are suicides, so only a third of those are even homicides, much less the ones that are justifiable by police or private citizens. So the numbers are going down as the number of firearms have increased dramatically over the past ten years based on checks and other survey data. It seems like we’ve got a lot more guns around than we did eight to ten years ago. In the meantime, not only is violent crime down, but homicides involving firearms are down. So the truth is, the problem isn’t as it appears to someone who just watches a news report every once in a while or believes a politician who says crime is rising. It’s actually not. So the way you deal with someone who’s bent on trying to rack up a big pile of body bags is you shoot back. And I personally don’t care whether it’s the security guard at the courthouse shooting back. I feel comfortable being disarmed when I go to the courthouse because they have metal detectors and there’s plenty of deputies there, so I feel fine. We should probably do that in schools. For example, I think schools are at least as precious as the money in the banks and most of them have armed guards. But letting me or any of us be our own first responders and taking our own responsibility to protect ourselves I think is honestly the best policy choice. Bob Ambrogi: So how would that have worked at the Pulse nightclub? Who should have been armed? Again I’m not entirely clear on what you’re suggesting. Should there have been more guards there, should the patrons themselves have been armed? You say you don’t want everybody to be armed, but who should have been armed? Steven W. Dulan: Let me be really clear. What I think we should do is eliminate laws that tell a potential attacker nobody here has a gun. I’m not saying arm everybody, I’m just telling you these sociopaths – and by the way, that’s why we’re never going to cure this problem completely because the data from the psychologists and psychiatrists says that about one in 20 people is a sociopath and has no empathy for his or her fellow human being. You can’t make violence go away. More people are beat to death every year in the US than are killed using rifles. There’s just going to be violence as long as we have human beings. So the policy choices are more about are you going to put a target on a place by calling it a gun free zone when we have a ton of proof that those signs don’t work and those laws don’t work. They are attractive to this type of person. Bob Ambrogi: What is the law in Florida? Florida has allowed some conceal carry handguns, right? Steven W. Dulan: Not in bar, I looked at it. J. Craig Williams: Well, gentlemen, it looks like we’ve just about reached the end of our program and it’s time to summarize, get your final thoughts and your contact information. Arkadi, let’s start with you and we’ll go to Steve after that. Arkadi Gerney: I think if you look at the mass shootings that we see which are increasing in frequency and if you look at the everyday shootings where there are 32 Americans who are murdered with guns every day and another 50 plus who are dying in gun suicides and gun accidents, it’s too much. Most Americans understand it’s too much. And whether you think it’s a good idea to personally own a gun or whether you think it’s a bad idea to personally own a gun, the vast majority of people including the vast majority of gun owners understand that there’s a bunch of things we could do to make it harder for certain kinds of people to own guns. And that doesn’t mean we will prevent every crime, prevent every tragedy, but we will prevent some of them in the same way that drunk driving checks and speed detectors prevent some car accidents and some fatal outcomes. Not all of them, but when you’ve got 33,000 people dying from gun violence every single year, cutting that down by 10% matters. J. Craig Williams: Again, Arkadi, how can our listeners reach you if they’d like to get ahold of you? Arkadi Gerney: They can find me on the Center for American progress website. J. Craig Williams: Thank you. Steve, up to you. Steven W. Dulan: Well, I think it’s interesting that we started off talking about assault rifles and it always ends up really just being a talk about guns. In order to be pro gun control, you have to somehow believe that you can make guns go away or reduce the numbers or control who gets their hands on them. And the facts are gun control is a failed policy of the past. It actually led to more gun violence in places like Chicago. And letting armed citizens take responsibility for their lives is really the best policy choice as far as that goes. In fact, I think the Paris terrorist attack is a great example of this. France has near complete gun control and those focused Jihadis were easily able to get plenty of hardware in place, the tools for their job, which was slaughtering a lot of people really quickly. They’re small, portable, they’re easily smuggled. I have a close friend here who’s a police officer, he’s got an AK 47 bullet in his hip from an AK that was never legally imported to North America. He was shot by a drug dealer, they just brought the gun in with the drugs. These items flow everywhere. So it’s a pipe dream to think that one more gun control law is going to make things any more safe. J. Craig Williams: And Steve, how can our listeners reach out to you? Bob Ambrogi: Well, thanks a lot. We’ve been talking with Steven Dulan, first vice chair of the Michigan Coalition of Responsible Gun Owners and Arkadi Gerney, senior fellow at the Center for American Progress. Thanks so much to both of you for taking the time to be with us today. Arkadi Gerney: Thanks for having us on. J. Craig Williams: Thank you. That brings us to the end of our show. When you want legal, think Lawyer 2 Lawyer.